It's kinda legacy at this point and every few years or so I have a large purge script that will delete multiple years worth of transactions. We apply the script to the consolidated database and then the delete statements replicate out via dbremote running on a scheduled task. A month later in production I find that although replication seems to be in synch it's as if the deletes never occurred on the remote database. So then I go back to the log and all I see is a roll back the end of a bajillion deletes. Any ideas? I realize I'm out of luck being that the Syabse is EOL, and we are trying to move to 16 here shortly... But just kind of curious if anyone has seen this before? Just to understand: When you applied the script at the consolidated, it was committed successfully? A ROLLBACK is posted to the transaction log when the connection disconnects. 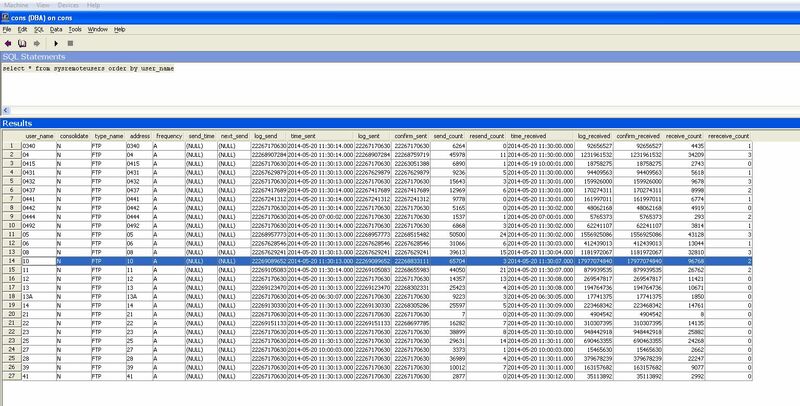 In the translated log, if you go to line 23206783 and search UP for "-1013-" do you ever see the transaction committing? There is a commit earlier in the replication but it is before the "big honking deletes" start. You should find that SQL Remote is resending those messages (with that big Delete transaction) over and over again until they succeeed. For these 2 remotes you will probably see the send/confirmed offsets are falling behind the other 'good' sites. You do want to confim that much first. SQL Remote is not going to skip big transacitons like that without some other major issue coming into play. The reason for the rollback is likely an error that dbremote -v -o should be logging for you. Nothing there? The offsets are not falling behind. You are correct in that that the log sent and confirm sent are not synchronized 100% as they replicate every hour or so. Importantly though they are more recent than the large delete that occurred about a month ago. @Nick: Are you sure about that? AFAIK, failing statements like DELETEs that fail because they would violate RI constraints or ALTER statements on non-existing database objects do not lead to rejected messages - the according statements are just skipped (i.e. the according transaction is rolled back) but they do not prevent other statements in the message message to be applied. You are NOT out of luck... technical support is still available for SQL Anywhere 9. If you are willing to pay for support, and are willing to be politely-but-firmly persistent enough to get past the [cough] unwillingness to help and "you must upgrade" exhortations, you CAN get help. In the very very very very very unlikely event the problem is caused by a bug in SQL Anywhere 9, it won't be fixed, that's what "EOL" means. In your case, going the pick-up-the-phone route is probably better than this forum. I will rip up the remote and re-extract it already did the little one, it's just risky for us to do the larger one because of the amount of activity and complexity of the entire application system. Since you are not capturing the logging of this we don't know if there is even any errors involved or some other factor. There may be no errors detected if (for some reason) those deletes did not match the subscriptions for those 2 remotes. You may have something in the way publications and subscriptions have been set up that could make this possible. And alterations of those could also cause gaps and overlaps in what gets sent. If there are errors being detected here (at the 2 remotes in question) then there are ways to handle and/or ignor those errors; and doing so could easily lead to this situation. Many of these are spelled out in this article . No formal analysis of the facts here (since facts are MIA without logging) but hopefully something here will be of some assistance. I have seen this happen before due to foreign keys. For whatever reason, a remote had a record that didn't exist in the consolidated, so when replication tried to commit the deletions, a foreign key error occurred on the remote. Might be something to look for. ..though IIRC, that should not rollback the whole huge DELETE but only the operations for those rows that would cause RI violations... - just because it's not the "statement text" itself that is replicated but the resulting operations (i.e. on a row-level), usually applied in grouped transactions (DBREMOTE -g n). Yes, the -g n does affect it. I'm not sure about all cases, but with -g 1, basically no grouping occurs, and they can all go. I would think SQL Remote would try to re-do failed multi-row operations (i.e. grouped transactions) by applying them one-by-one. Thanks for your input, in the case of this database all the relevant child tables are set to cascade delete.